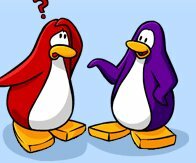 The CPCT, is the Club Penguin Cheater Team. The members of the CPCT: Pugin94, Flame Blaze, Karata Ninja, Gunter143, and Betabill8990. The CPCT's job is to help people with things they don't know. It's pretty easy, since we know most of the secrets to Club Penguin. We can find out what the next pin is, by looking VERY closely into videos. Can you see the CPCT often? You can find the CPCT often, but it's HARD to find them. They move to different rooms and servers constantly. That's why if there was a stamp for meeting the CPCT, it would be Extreme. What servers are the CPCT usually on? They can be on Mammoth, Alpine, Parka, Cold Snap, Wool Socks, and Sleet. They're usually on empty servers. But they can also be on Parka and Sleet often, too, since that's usually where the rare people hang out. (Also the ones who love bacon pie, LOL). Which member are the hardest to find? Pugin94 and Flame Blaze are the hardest to find. They go to different rooms and servers constantly. Which member is the easiest to find? Gunter143. He usually goes on a server and stays on that server. He can go on Wool Socks sometimes. Do you like my website? Leave a comment!